5 Essential Kitchen Upgrades On A Budget - Citizen Contracting Co.
Is your kitchen a little lackluster? Perhaps space is no longer functional or isn’t large enough for you and your family, and you are looking for a solution that doesn’t require moving into a new house. Maybe you simply have a little money to invest in your home, and you figure the kitchen is the best place to spend your money. In fact, the kitchen is the single best room to upgrade in your home as it is the most used home in any house, and it is also the room that sells a home the quickest and for the most money. On the flip side, a poorly structured, outdated kitchen can be a hindrance when it comes time to sell. Regardless of why you decided to upgrade your kitchen, you have come to the right place, as this article outlines some of the best upgrades you can make in your kitchen, including custom kitchen cabinets. Are you ready to upgrade and improve your kitchen so that the space is more functional, up to date, and attractive? Here are several essential kitchen upgrades that will help you make the most of your money and your space. In fact, with a kitchen remodel that is comparable with others in your neighborhood, you could be seeing a return on investment as high as 81%! A more functional floor plan: Many kitchens (especially in older homes) have a poorly planned space that is not conducive to cooking or to entertaining. Modern kitchen spaces have open floor plans that allow you to cook, serve, and entertain in an open and inviting space. If possible, knock down a wall or rearrange a few appliances to give your kitchen a more open and inviting feel. In much older homes, you may need to rewire in order to move appliances into the much sought-after kitchen “triangle,” which allows for better access to your range, sink, and fridge. Improved lighting: Older kitchens tend to be on the darker side, so taking down older, outdated lighting fixtures and replacing them with canned or recessed lighting that brightens up your space is a worthy investment. 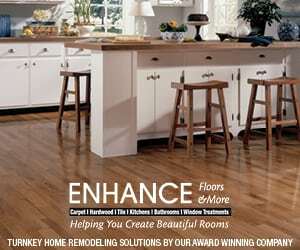 New flooring: If your kitchen flooring is outdated, it is probably time to rip up that linoleum and install something more attractive and timeless. Wood flooring (or its laminate counterpart) never goes out of style and is always sought-after by potential home buyers. A tile is also a great option, just make sure you choose your flooring materials carefully. In order to save some money, you may even be able to install the flooring yourself. New countertops: Countertops are a great way to increase the wow factor in your kitchen. There are limitless options on countertop materials, and with so many choices, there is no doubt you can find something within your budget. Granite and marble are high-end choices, laminates are less expensive. New cabinets: Next to your appliances, your cabinets are the most used tools in your kitchen. Your cabinets are essential for storage, but there is no reason for your cabinets to be dark, dingy, and outdated. If you have the money to invest in custom kitchen cabinets, you will undoubtedly see your investment returned if you ever sell your home. If you don’t have the money to invest in brand new cabinets, there are still a few options available to you. You can paint or refinish your cabinets for a fresh look. You can leave the cabinet frames and just upgrade the door fronts to save some money. You can also install new hardware for an updated appearance.